I was able to watch the fight as I DVR’ed my purchase from HBO after I worked last night and I was shocked to say the least. I am a Pac-Man fan, but he should not have won last night. Marquez out boxed him for most of the fight. This was clear not only to me but many fans as the ruling was announced in favor of Pacquiao. 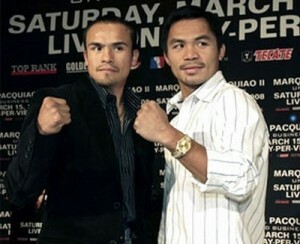 Marquez was more efficient with his counter-punching style, while Pacquiao played the aggressor. Pacquiao landed 176-578 punches while Marquez landed 138 of 436. Watching the fight, I can tell you that Marquez’s punches counted as they were much harder when they connected. A headbutt in the 9th left Pacquiao with a cut over his right eye and a cut in his mouth, while toward the end of the bout Marquez had his eyes closing and his face was swollen but neither fighter was seriously injured. This “win” for Pacquiao undoubtedly has to set up a fight with Mayweather Jr. Mayweather’s last fight was controversial as well as Ortiz threw a bunch of rabbit punches and ended with a headbutt against the ropes that ended up stopping the fight as a point was deducted. Ortiz made a crucial mistake in fighting dirty as Mayweather Jr. retaliated as they touched gloves and backed off from each other for just a split second. Mayweather Jr. then unloaded with a left hook and a right shot to the face of Ortiz as he dropped to the mat and was unable to beat the 10 count from referee Cortez. Mayweather is not perfect by any means but Ortiz failed to follow the oldest rule in the book, keep your guard up at all times. This win for Pacquiao and Mayweather Jr. should secure a bout the boxing world has been waiting for, mired by disagreements over purse money and drug testing stipulations. Mayweather Jr. may be electric, but so can Pacquiao. The fight when it does happen, will end in knockout, but I cannot safely pick a fighter at this time.